A ton of new "Star Wars" toys and collectibles are being revealed as we near the 40th anniversary of "A New Hope." Last week Lego announced its exclusive "Star Wars" Celebration set, and Hasbro recently unveiled its 40th Anniversary Legacy Pack. For starters, this "Star Wars" turntable is seriously out of this world. It's portable, connects to bluetooth, and is decorated inside and out with cool "Star Wars" art. Crosley Radio created the limited-edition record player in celebration of the "Star Wars" anniversary and the 10th Annual Record Store Day on April 22 — which is when these turntables will go on sale. The turntables will cost about $109.95 each, and you can find them in independent record stores across the U.S.
Hasbro also unveiled some more "Star Wars" action figures for its Black Series coming soon to a toy store near you. One set features Rey and her speeder as seen in "The Force Awakens." 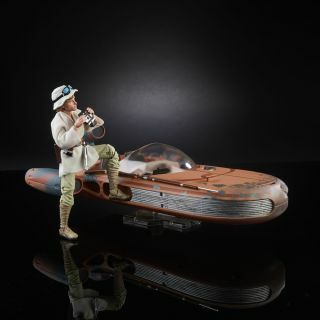 A second set includes an X-34 Landspeeder and a 6-inch Luke Skywalker action figure. Both sets will become available this fall and will cost about $60 each.